Juniors from Alberni Golf Club take 4th, LONG WEEKEND! Congrats to the Brian Rands coached team of Cody Cootes, Brittany Mallon and Michael Graydon pictured above, who placed fourth at the BC Pro-Juniors in Vernon last weekend. Way to go guys and gals! And yes, it's LONG WEEKEND TIME! It's another hot forecast as of right now until Tuesday, with every day above 30 degrees. Just BE CAREFUL please. Sunscreen, shade, shirts, hats, etc. Moderate amounts of alcohol. No operating cars and trucks and boats and quads and airplanes and helicopters and golf carts if you are having too much fun, or heck, even any. Get a DD, play it smart, etc etc etc. There's my public service announcement. I doubt it helps, but I don't want a tragic long weekend and neither do you or your family or your friends etc etc etc! The "code" What do you think about this? MONTREAL - A Quebec junior hockey player accused of assaulting an opponent with a cross-check to the face during a heated contest last fall was merely following hockey's unwritten code of engagement, his lawyer argued Thursday. The accused is facing one count of assault causing bodily harm and a second charge of assault with a weapon. During closing arguments in Quebec youth court, defence lawyer Richard Shadley said the stick attack was accidental and the Crown overreached by pursuing charges. Because of a publication ban, neither the accused, the victim or the teams they play for can be identified. But the case revisits the fine line where sport and crime intersect on the ice. The alleged assault happened during a Quebec Major Junior Hockey League game last season. After a whistle stopped play, a melee ensued with players from opposing clubs squaring off. Shadley argued his client was trying to ensure none of his teammates were outnumbered. "When there's a skirmish like this, everyone takes an opponent," Shadley said. "That's what he intended to do." The accused, now 18, matched up with the only opposition player on the ice without a sparring partner and allegedly delivered three cross-checks to the chest of the supposed victim, who didn't react to the shots. But the fourth shot, a violent cross-check, apparently caught the opposition player square in the mouth, sending him to the ground. The entire incident lasted about four seconds. Shadley said his client wanted to gauge his opponents' interest in fighting and was trying to get him to drop the gloves. He pointed to an unwritten code of conduct that governs the game on the ice. "The code is an integral part of this case because the code gives you the key to consent and consent is one of the basic elements in the offence of assault," Shadley said. The victim, who needed a stitch to fix the wound, missed about six minutes of the game before returning to play. Shadley said the incident was minor and pointed at high-profile NHL altercations such as those that left players Steve Moore and Donald Brashear injured. But Crown prosecutor Ellen Baulne said the case was not an isolated incident and argued it didn't mean an assault hadn't taken place just because the victim didn't miss significant ice time. Baulne argued consent is not implied by simply being on the ice when a stick is used as a weapon. She said the victim in the case had no chance to duck the stick shot. Shadley told Judge Jacques A. Nadeau the first three shots didn't even constitute a sanctionable offence under the rules of hockey. "There are levels of sanction which everyone agrees to - penalties, suspensions, game suspensions," said Shadley. "Then, and only then, we cross the final threshold into crime, criminal record, potential jail." But the code calls for a player who doesn't want to engage in fisticuffs to give a sign. "He turns away, he skates away, he grabs your stick, he looks the other way, there are all kinds of signals that are given," Shadley said. "That's what is done in professional hockey because no one wants to be an instigator because if you instigate, there's an additional penalty." Shadley also questioned why it took the victim five days after the incident to file a complaint with police if he thought the attack was intentional. "There was no bad blood between these two boys," Shadley said, adding his client skated off the ice and was by all accounts shocked and disappointed in what he'd done. A series of brawls brought about widespread calls in Quebec to bring about tougher sanctions in hockey and prompted the QMJHL to crack down on on-ice violence and impose longer suspensions. During the trial, a QMJHL official testified that fighting remains part of the game although Pierre Leduc said the number of incidents have been nearly cut in half. But the league has not eliminated fighting altogether and acknowledges it remains part of the game. Both the accused's father and mother were in court, as was the victim in the case. Nadeau will render a verdict on Sept. 18. Sidhartha Banerjee, News from (c) The Canadian Press, 2009. I was more than a little taken aback yesterday when I checked sportsnet.ca on my phone and saw that former Bulldog Kellan Tochkin had been signed by the Vancouver Canucks. Tochkin was with the Dogs early in the 2007-2008 season, after being released by the Everett Silvertips. The Dogs management at the time gave Kellan a look, but as he wasn't getting in the line up every night they in the end decided that it would be best for his development if he went and played 1st line minutes in Junior B. It was made clear at the time that they wanted to keep him within the organization for the future as they saw his potential. If I remember correctly, Tochkin didn't really like that idea much and looked for another BCHL team to suit up with. Langley subsequently offered Tochkin an opporunity to play with them, but that didn't translate into a full time opportunity either as he was still in and out of the line up on a regular basis. I remember going to a Clippers vs Chiefs playoff game that year where I ran into Tochkin in the stands during one of the intermissions. I told him to just stick with it, as he was still young, and he would still get his opportunity. And tahhhh dahhhhh he's just been signed by the Vancouver Canucks. Way to go kid! He never did play another BCHL game I don't think, as he went straight to the WHL with Everett the next season and lit it up. More great news from Alberni Wrestling …..
1. Local coach James Messenger has been selected as the coach of the Canadian National Fila Cadet Womens’ team to the Pan American Championships in Nicaragua August 12 - 17. Messenger coached many of these young woman in May at the World Championships and then later worked with them at a the Canada Cup and a camp in early July. The Pan Ams will be another major accomplishment for this Alberni wrestling alumni and current head club coach. 2. Michael Cappus left yesterday for a Canada Games training camp in Jasper Alberta. Cappus is on Team BC who will compete at the Canada games in PEI in mid August. PORT ALBERNI, BC - The Nuu chah nulth Tlu-piich Games are back after being on hiatus for five years! This year the Tlu-piich Games are focusing on the grassroots people. We are working to have a family-fun orientated event to make sure all our young athletes participate and have life-long memories of this year’s Tlu-piich Games. The Games start on July 31, 2009. The first event is Junior Ball Hockey at the Maht Mahs Gym. Opening Ceremonies will start at 7:00pm at the Maht Mahs. Lahal or Bone Games will be at the Hupacasath House of Gathering starting at 9:00pm. Day two will consist of Junior Softball, 3 on 3 Basketball (2 Divisions, Senior and Junior). Day three will start with Mixed Slo-pitch, the continuation of 3 on 3 Basketball, and the start of Track and Field Events at Bob Daily beginning at 6:00pm. Finally, Day four we will finish off Track and Field Events, Fun Activities, and Closing Ceremonies. Glenwood Centre will be open throughout the day for vendor booths, activities, and for spectators and athletes to get a break from the sun and heat. Registration forms are ready and can be picked up at any Nuu chah nulth Band Offices, the Port Alberni Friendship Centre, or by calling the Tlu-piich Games Coordinator. The Games are always looking for eager volunteers. Your expertise is needed! If you are looking to volunteer you can call the Tlu-piich Games Coordinator. 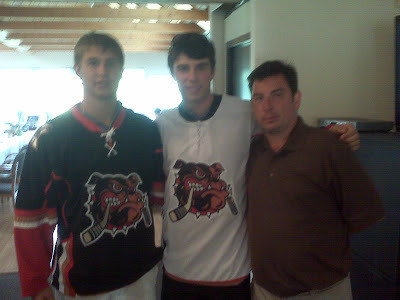 Bulldogs make trade, acquire Dziurzynski, move Georges and Garrett, interview on THE PEAK Friday. The Alberni Valley Bulldogs have acquired the CJHL playing rights of 89 F David Dziurzynski in exchange for the CJHL playing rights of 90 D Liam Gorges and 91 F Jackson Garrett. The 6’1” 185lbs forward played the past two seasons for the Lloydminster Bobcats of the AJHL. The Lloydminster native scored 12 goals, added 25 assists for 37 points while also serving 185 minutes in penalties. “David is a strong skating power forward; he is a welcomed addition to our hockey club.” comments GM/Head Coach Nolan Graham. “David will be expected to contribute offensively next season, while also providing a physical presence.” adds Graham. The Alberni Valley Bulldogs would like to thank Liam and Jackson for their contributions the organization, and wish them all the best in the future. 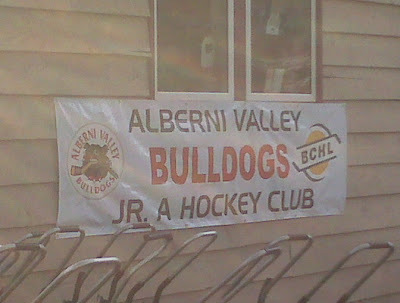 The Alberni Valley Bulldogs main camp will begin Monday August 24th at the Alberni Valley Multiplex. To Jackson Garrett and Liam Georges - Best of luck in the future with your new teams fellas. 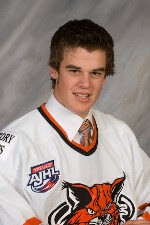 We'll be seeing Garrett plenty as he has subsequently been traded back to the Island to the Cowichan Valley Capitals. Both players are great kids with tons of potential. And it's all because of one simple picture. 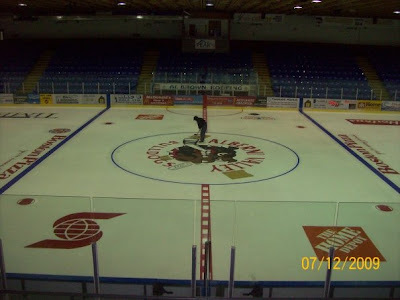 The ice going in. What a beautiful sight. Photo taken off of Walt Collins' facebook! The Alberni Valley Charity Classic is done for another year. And planning for the 17th annual event will start pretty soon I'm sure. It's a HUGE event to throw and all of the organizers and committee members and golf club staffers deserve a huge round of applause for another wildly successful event. I haven't received the final total dollar figures but you can bet your bottom dollar that there's some pretty happy charities around the province and the valley after this weekend. The amount of monies raised by a community this size is just staggering. Way to go Port Alberni! And a big thanks to all the visitors to the valley who took part in the event that brought their pocketbooks too! 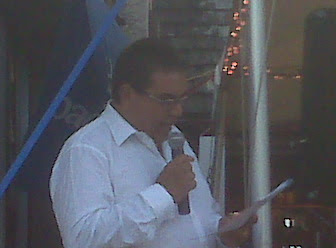 MC and Club President Les Doiron addresses the crowd. The MAN. Rob Schick was honored this year with this being the 16th annual event. Rob of course just retired this last season while wearing #16 on his back. Incredibly, his team won the event with a - you guessed it - 16 under par score. Rob's jersey was retired and presented to the city, as was the beautiful picture below with Rob working the "Queen" game when Wayne Gretzky accompanied Queen Elizabeth II to a Canucks game where she dropped the puck. Left to right - Club Pro Bruce MacDonald, Mayor Ken MacRae, Rich Chernomaz, Ron Paulson, Canucks play-by-play voice Joey Kenward. Without a doubt, the highlight of the event was Rob Schick speaking on Saturday night. It's the only video I captured on my phone all weekend....but that's ok because it was THE moment of the weekend and a pretty special moment so I'm happy I captured it to share with you. Rob gets a little choked up, the crowd gives him a standing ovation, and Rob finishes with some very wise words about officials in the game today and how they should be encouraged. Enjoy. I'll do my best to get a final total on the charity dollars raised. Way to go golfers and spectators, volunteers and sponsors. This is pretty cool. Thanks to Gary for sending the info and pic along. The Canuck prospects take on the Grouse Grind once again to finish off the annual summer development camp. The group was split up into four groups of five and one group of six to scale the Grouse Mountain. Peter Andersson, Anton Rodin, Kevin Connauton, Matt Butcher, Jeremy Price, Glenn Carnegie (Moose trainer). Over 23,000 raised on Friday night ALONE. I just checked my link to all of my page traffic - you can see it for yourself by clicking the white and green SITE METER button over there ----------> on the right. I've been too busy lately to even realize that a while ago the PAGE VISITS number eclipsed six figures. All I can say is WOW, and THANKS for all of your support and interest! Alright, down to business here as I have plenty to talk about and not a lot of time to do it! Alberni Valley Bulldogs Head Coach and GM Nolan Graham will be on THE PEAK morning show just after 8:00am today to talk about all things Bulldogs - their hockey camp coming up, the need for Billets for the upcoming season, AND - I'm sure there will be a couple of words said on how the task of assembling the team has been going over the summer. The Alberni Golf Club in Cherry Creek is THE PLACE to be this weekend, with the 16th Annual Charity Classic kicking off tonight with the Wine and Cheese followed by the Golf, Party, Silent and Live Auction and who knows what else going tomorrow night. I know what else happens tomorrow night and that's the honouring Port Alberni Native and recently retired NHL referee Rob Schick. If you aren't in for the golf, come for the dinner and for the party! For more info, call the Alberni Golf Club at 250-723-5422 or the office for dinner tickets at 250-723-7111 but for goodness sakes HURRY!!! "Burnaby" Joe Sakic is hanging up. And all I can say is THANKS. What a classy guy, what an incredible player and leader. I had hoped that he would hang on for one more season to hopefully play the Olympics at HOME, but you can't argue with someone making the decision to end their career. I don't know about you, but I will ALWAYS remember him from THIS GAME. And Bob Cole. JOE SAKIC SCORES!!! 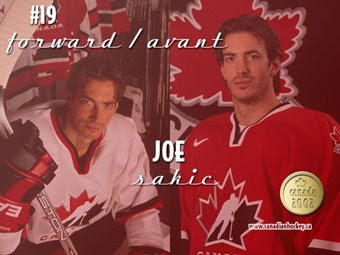 I'm not sure how many people remember that Sakic was MVP of the 2002 Salt Lake Olympics. The Alberni Valley Blazers are hosting the Pee Wee "B" Girls Fastpitch Provincials this weekend, with action going from today all the way until the final game at 3:00pm Sunday. 16 - yes, SIXTEEN teams are in town for this event. The Blazers play at 11am and 5:00pm on Diamond #1 and again tomorrow at 8:30 and 12:30pm again on Diamond #1. Opening ceremonies go at 1pm today again at Diamond #1. Good luck to the Blazers and all teams participating. Hello and thanks for checking the blog! Here's the latest update from local wrestler Travis Cross. Thanks as always to Travis for the update. Hi all. Just a quick update on my recent tournament in Guelph, Ontario this past weekend. I wrestled 3 matches winning 2 and losing in the final to take second place. It was the second time I wrestled Danny this year, the other time being the finals at the National Championships. I felt alot better in this meeting, feeling more relaxed and in control. For those who are not sure how the scoring works, the 3-1 is 3 points for me to 1 point to my opponent in the first 2 min round. in the second 2 min round I had 7 points to his 0 and I pinned him ending the match. Each match is best two out of three rounds. I felt very good and controlled the pace of the match. I won the first round 2-1. The second round I was leading 2-0 and then got caught in bad position for a second and was pinned. The tournament was another important step in preparing for the 2009 Senior World Championships in September in Denmark. I will take what I learned to the practice mats and continue to improve my game. My next tournament will be the World Police Fire Games at Douglas College in Coquitlam, August 1st. Don't forget the Alberni Valley Charity Golf Classic coming up this weekend! There are still spots open for golfers, so hurry up and call the course at 250-723-5422. It's a big one this year (as it is every year) with Rob Schick again attending and being honored with this being the 16th year of the tournament. 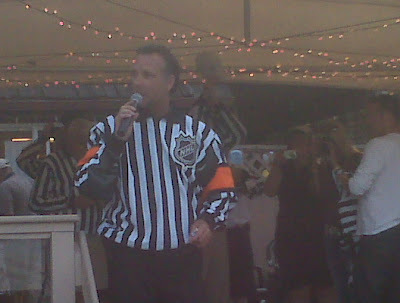 Rob started the tournament, wore #16 as an NHL referee, and retired this past season. Lots of reason to celebrate. Of course, CHARITY is what it's all about, with local and provincial charities being the big winners when it's all over! Whew, what a great time at the first ever Alberni Valley Bulldogs Alumni weekend! Things all started Friday with a bus trip down to Parksville for an entertaining game of Alumni Shinny. Players taking part were: Ram Sidhu, Tyler Milford, Josh Bonar, Chris Demoe, Tyler Boice, Joe Scali, Matt Auerbach, Stephen Pattison, Daniel Moriarty, Marcello Ranallo, Rob Woods, Croft Kurka, Bert Watkins, Dan Wallace, Jordan Kremyr, Brad Herman, Andrew Riddell, Braydn Melsrose and Jim Patterson. Special guests included referees (blind, slow, with poor balance and running video cameras) Tom McEvay and myself. And someone who was at least paying attention, Steve Bratt. Bulldog goaltender Frank Slubowski was a late replacement for Brian Stewart, who had better things to do. Like CANUCKS PROSPECTS CAMP. More on that later, but a huge congrats to Stewie for getting an invite. The game was a little of everything - up and down, side to side, etc etc etc. 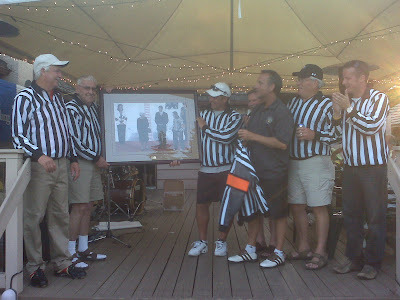 The next day it was off to the Alberni Golf Club for the 1st ever Alumni Golf Challenge. I don't even know where to begin with golf. Lets start with a tip o' the cap to my teammates - Bert Watkins, Josh and Gord Bonar, and Alberni Golf Club Head Pro Bruce MacDonald. OF COURSE we won the thing at 10 under par, look at all that talent. EVERYONE pulled their weight. "Watty" made a couple key putts as did Gord Bonar, with a putt to remember on the ridiculously tough 10th green. I was the "drive for show" guy, and Bruce MacDonald was the "chip (and putt, and short game) for dough" guy. Josh was the all around guy, crushing a couple of drives. A couple highlights. On the 18th hole, I crushed a drive over 300 yards. Here I was, thinking I was the hero. The first four players of the group go next trying to get us on the green from just 49 yards out. And we all fail. Up comes the pro. It looked good right off the club. It hit the green and bounced once, twice, and then started rolling. We all started screaming GET IN THE HOLE and the next thing you know, that baby disappeared into the cup for an Eagle 2. And the celebration was on. The final highlight came on the 6th hole. We had a nice drive by Bruce up the middle, and we needed a good shot to give us a good chance at birdie because we knew that a couple of teams were posting low scores. As we reached our ball in the fairway, we were quite rudely besieged by a group heading up number seven who came over to our ball to spectate. Croft Kurka, Grant Coates, Joe Scali, Devin Timberlake, Jordan Kremyr and Larry Doucette were the guilty party. Sorry if I missed anyone, but it was quite the circus. We tried to hit our shots, and none of them were pretty good. Bruce then stepped up to hit, and was CHALLENGED by Croft Kurka that he couldn't put the ball within five feet from a 100 or so yards out. Never challenge the pro. Bruce answered the challenge of the *ahem* "friendly" bet and got ready to hit. With anything less than your average golf gallery looking on. And yelling on. And on and on. Bruce checked the wind, and even changed clubs from his original selection. And then WACK, he hit it to within 2 feet. Maybe 1. And that's why he's the pro Kurka. haha. Another highlight of the day was the unveiling of the new Bulldogs jerseys, as modelled below by current Dogs Robert Lindores and Warren Muir. I know, I know, it's 100% impossible to please EVERYONE with a jersey design. But, as always, I LOVE IT. Former Bulldog Trainer Matt Auerbach, now with the Chilliwack Bruins joins the picture. Huge thanks to Dennis See, Tom McEvay, the See Group of Companies, the Alberni Golf Club and their incredible staff, and all the sponsors and fans that supported the event. Here's hoping it can become something that happens every year, or at least every other year. As mentioned above, former Dog Brian Stewart was supposed to attend the weekend, but he "got the call" to attend the Vancouver Canucks prospect camp. That's huge news for Stewie, and great news for the Bulldogs to have one of their alumni in an NHL camp. How about TWO former Bulldogs attending NHL camps?! Yes, it's true. Former Bulldog Maury Edwards has been invited to the Columbus Blue Jackets camp. Congrats to both players, and good luck! Last but not least for now - The Alberni Wrestling Club's Kid Wrestling Camp! The Alberni Wrestling Club is once again hosting their annual Kids Wrestling Camp July 7-9th in the ADSS gymnasium. The camp will run over three days from 10am to 12 pm and will feature instruction from local coaches, alumni, and high school wrestlers. As well as learning some basic wrestling moves and technique, the camp participants will also partake in fun wrestling themed activities. During the month of June, high school wrestlers visited the local elementary schools to introduce and promote the sport of Olympic wrestling. Through games and skill development the participants were given the opportunity to try the sport while being in a fun and safe environment. "When we [the wrestling club] introduce wrestling at elementary schools and the kids camp, we always stress the importance of fun and safety," explains Cody McEvay a current ADSS high school wrestler and one of the summer workers in the Alberni program. "We always go through a proper warm-up and stretch to limit the possibility of injury and try hard to reveal the enjoyment of wrestling rather than the competitive side." The camp will be a great opportunity for kids to stay active and meet new friends over the summer break. For some it will serve as a kick start to summer and being a part of the wrestling programs at the local middle schools. Others may come to simply enjoy participating in the fun games. The camp focuses on participants in Grades 4 -7, although there are some cases where younger and older athletes have been involved. If you already feel like you would benefit from some time away from your kids over the summer, this would be a perfect event to take part in. The camp will run from 10 am to 12 pm all three days with registration being held each day starting at 9:30. There are registration forms available at the gymnasium which needs to be filled out by a parent/guardian. Participants are asked to bring gym strip and clean running shoes. If you have any questions or concerns feel free to contact Cody McEvay at 250 724 0577. DANY HEATLEY, Bulldogs add Cecere.....Interview on THE PEAK this AM. Just a quick thought on Dany Heatley....and any other player that takes the same steps he has taken. If you have a NO TRADE CLAUSE and you DEMAND TO BE TRADED, then your NO TRADE CLAUSE should be null and void. Stupid. "I DEMAND to be traded.....I just signed a multi-year deal last year....but sorry, you can't trade me there"
The Alberni Valley Bulldogs announce the signing of 90 D Nick Cecere. The 6’0” 185lbs is from West Des Moines, Iowa. He began last season playing for Northwood Prep School before leaving to finish the season with the Des Moines Buccaneers in the USHL. Cecere will suit up for the University of Nebraska Omaha in either 2010 or 2011. “Nick will provide stability on our backend, he is a strong defenseman, he skates well and competes extremely hard in his own end.” comments GM/Head Coach Nolan Graham. “He plays physical and makes a good first pass breaking out of our own zone. I am excited to have Nick as a member of our team.” adds Graham. 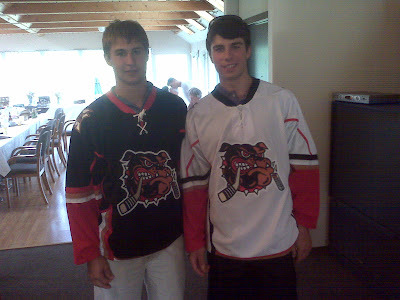 The Alberni Valley Bulldogs are hosting an Alumni Golf Tournament Saturday July 4th 2009. The Tournament will be a shotgun start at 1:00pm at the Alberni Valley Golf Club with dinner to follow. The tournament is a scramble format. Tyler Ruel, Stephen Pattison, Josh Bonar, Jim Patterson, Devin Timberlake, Dan Wallace, Bert Watkins, Matt Auerbach, Joe Scali, Brian Stewart, Brad Herman, Andrew Riddell, Bradyn Melrose are a few Alumni that have confirmed to be in attendance. Here is your chance to play a round of golf and enjoy an evening with your favorite Bulldog from years past. Individual event tickets are on sale now in the Bulldogs office for only $65. Space is limited, be sure to register soon. For those unable to attend the golf, you can join the players for a steak dinner at the Alberni Golf Club beginning at 6:00pm. Dinner tickets are on sale for $20. It feels like Monday a bit with yesterday being a day of for Canada day, doesn't it? Saturday is sure to be a fun day, with the Bulldogs Alumni Golf Tournament at the Alberni Golf Club in Cherry Creek. Besides the fun that will no doubt ensue during the golf, and the dinner afterwards, I'm most excited about the Dogs unveiling their new sweaters! Yes, current Bulldogs Robert Lindores and Warren Muir will be on hand to show off the new duds around dinner time. There's still time to golf so call the Dogs office ASAP at 250-723-4412. The teetime Saturday is 1pm. There will be 18 holes of golf in a scramble format, followed by prizes and a steak dinner. If you are only into DINNER, you can purchase a ticket for just that as well. Again, call the Dogs office!